As I rode around Berlin in an S-class steered by a handsome German driver (somebody pinch me — how did I get here?) in a subtle cloud of “Sports Mood,” the freshest of Vom Ende's four car scents, sometimes the fragrance was so light as to be subliminal, the scent of green florals and woods melding in with the scent of expensive leather. Martin Bremer said that in choosing leather for the Mercedes interiors, the feel and look of the leather weren't the only criteria — the scent of the leather was factored in, too. As Paris Hilton would have said, eons ago when she was relevant, That’s hot. I preferred the customized fragrances Vom Ende composed to the ones I brought to try out. 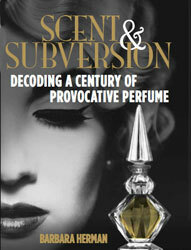 My fragrances were meant to be worn on skin; Vom Ende’s, to be dispersed within the confines of a moving vehicle. When I tried out one of my fragrances in the Air Balance, it was a little headache inducing, the notes a little imbalanced and overpowering. It’s interesting to me that Mercedes-Benz is adding olfactory luxury to the already luxurious experience of being in a Mercedes. (I’ve written elsewhere about the trend of fusing technology and scent; the Air Balance is yet another example of this trend.) Almost every choice the Mercedes engineers and designers make already takes beauty into account as well as function, and some design elements are purely for aesthetic reasons. It makes sense to extend that luxury to our most neglected — but highly visceral — sense, our sense of smell. If you’re going to add Swarovski crystals to the headlights (see left) — why not add the scent of incense, amber and woods for its interior? Vom Ende noted that he had to be careful not to make the scents too narcotic; people are on the road after all! I’m sure they don’t want to be associated with the first ticket for DUIOP — that is, Driving While Under the Influence of Perfume. To the "masculine" world of the car, Daimler futurologist, the fascinating Sabine Engelhardt, creator of the Air Balance, brought the “femininity” of perfume. Of course, these designations of masculine/feminine are socially constructed, but let's face it, that's how the worlds of Cars and Perfume are figured. It's not insignificant that a woman talked the Mercedes team into the idea of adding scent to the driving experience. The Mercedes-Benz experience is already an over-the-top fetishistic experience, why not add scent? The word “fetish” is often used negatively, as the symptom of something, spoken about as pathological. But there are benign forms of fetishism that enrich our lives, including aesthetic fetishism. What is aesthetic appreciation if not a kind of fetishism? Art, movies, music, architecture, food or…perfume, these things are not intrinsic to our survival, but they enhance our lives in crucial ways. As a fragrance lover, I have no doubt that there is a fetishistic quality to perfume-loving — giving every aspect of it a kind of heightened, fantastical power. The ads, the bottles, opening a new box or bottle, dabbing or spraying the scented liquid onto your skin, and sniffing it — all of those rituals add to the sublime pleasure of taking a fragrance into your nose and body and brain. I sometimes keep several decants of perfume with me in my purse, and when I feel like a little “bump” of olfactory pleasure, to deploy drug lingo, I just take some out, spritz, and have my own semi-private experience.